Everyday food with low calories… Not sure why Hairy Dieters claim this is a Spanish style, though. Probably is the chorizo and the roasted garlic… In any case, it is cheap and cheerful with delicious flavours, from the sweetness of the baked onion to the spiciness of the chorizo. While the vegetables are roasting, skin the chorizo and cut the meat into thin slices. Put the chickens on a board and carefully slash each one 2 or 3 times with a knife. Season all over with black pepper. Mix the paprika and oregano together and set aside. Take the roasting tin out of the oven, scatter the chorizo over the vegetables and turn everything a couple of times. 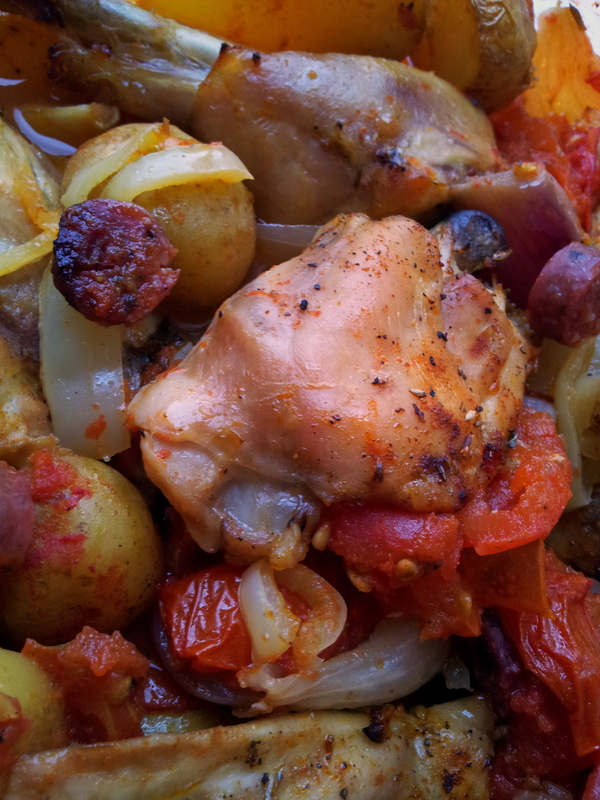 Place the chicken on the top of the vegetables and chorizo and sprinkle with paprika and oregano. Return to the oven and adjust the temperature to 220oC. Leave in the oven for another 20min, or until the chicken is golden and crisp. Every now and again, take the tin out of the oven drizzle the juices over the chicken. As you eat, squeeze the garlic out of the skins. After The Spicery and The Laughing Lemmon, now is the turn of the Hairy Dieters. 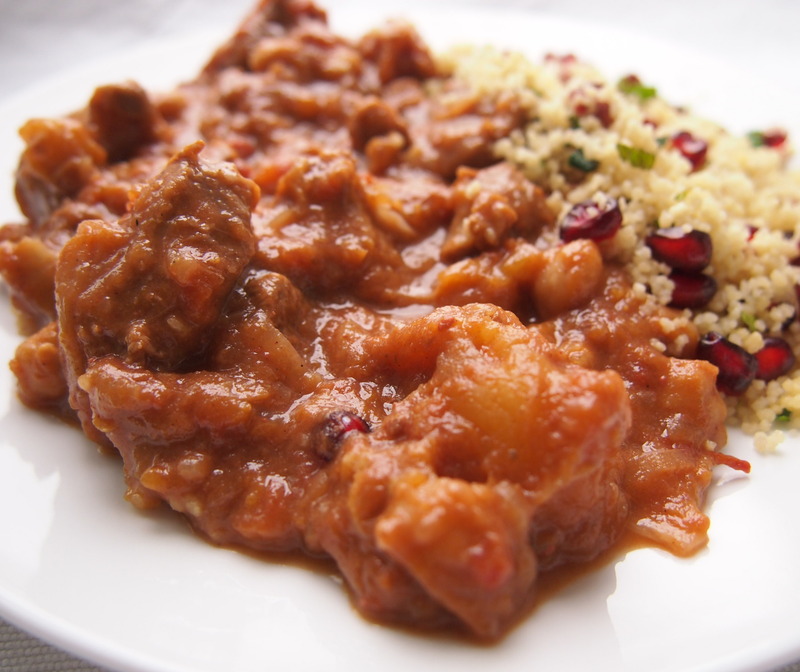 Again, the same basic ingredients: lamb, spices and fruits. But, it also had chickpeas and tinned tomatoes. And it was sweet. Very sweet… probably one spoon of honey too much for my taste buds. All in all, it was delicious and filling. In fact, a lot more heavy than the other version even though it had much less fat. Don’t take me wrong – it was delicious. It is the comparison with the Laughing Lemnon’s which it makes it sound like a bit pedestrian. Trim the lamb of any hard fat and cut into rough 3cm chunks, season all over with salt and pepper. Mix the cumin, coriander, cinnamon and chilli in a bowl. Heat oil in the tajine until is piping hot. Add the lamb, onions and garlic and stir fry over a high heat for 1 minute until lightly coloured. Sprinkle with the spices and cook for 1-2 mins more, tossing constantly until you have a fragrant aroma. Tip the tomatoes into the casserole dish, together with the cold water, honey and chickpeas. Add the stock cube over the top and stir well. Bring to a simmer, stirring couple of times. Cover with the lid and let cook with low heat for 60min. Open the lid and drop in the dried fruits and still well. Put back the lid and let it cook for another hour, or until the lamb is tender. For a couple of days, I start to believe it was possible, after all, to feel the Spring. I even looked for my sun glasses and rush to the basement to a light coat… Well, much for my dismay, it seemed that Summer was last Tuesday, right on the very day I had a TC I could not reschedule. Wednesday was a bit iffy, Thursday, autumnal. Saturday, we all woke up to snowfall. Heat the oil in a large flameproof casserole dish or wide, heavy-based saucepan and gently fry the onion and celery for 8 minutes until well softened, stirring occasionally. Add the garlic and cook for 2 minutes more. Don’t let the garlic burn or it will give your stew a bitter flavour. If the onion starts to stick, add a splash of cold water to the pan. Meanwhile, peel the potatoes and cut them into rough 2cm chunks. Deseed the pepper and cut that into chunks too. Stir the ground coriander, saffron and bay leaves into the casserole and cook for another couple of minutes, stirring constantly. Pour over the wine and let it all bubble for a few seconds before adding the yellow pepper, potatoes, chopped tomatoes, tomato purée, water, stock cube and sugar. Season with the ½ teaspoon of salt and plenty of ground black pepper. Bring the stew to a gentle simmer and cook uncovered for 15 minutes, stirring occasionally, until the potatoes are softened but not breaking apart. Trim the green beans, cut them in half and add them to the pan, then return to a simmer. Cook for a further 5 minutes, stirring occasionally. Season with more salt and pepper to taste. Remove the skin from the fish fillets and cut the fish into rough 2.5cm chunks. Drop the fish pieces on top of the bubbling liquid and cover the pan with a lid. Poach the fish over a medium heat for 3 minutes or until it is almost cooked. Remove the lid and very gently stir in the prawns, trying not to break up the fish too much. 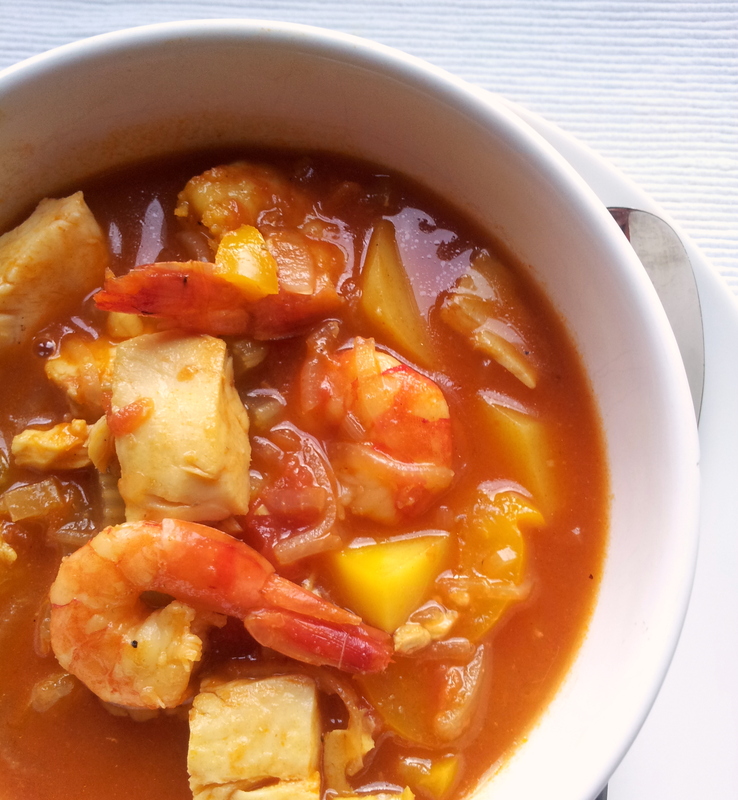 Cover again and simmer for 2 minutes more or until the fish i opaque and the prawns are hot. Don’t let the prawns overcook. I could be writing about lovely Spring dishes, with plenty of asparagus, rhubarb and green stuff all around. 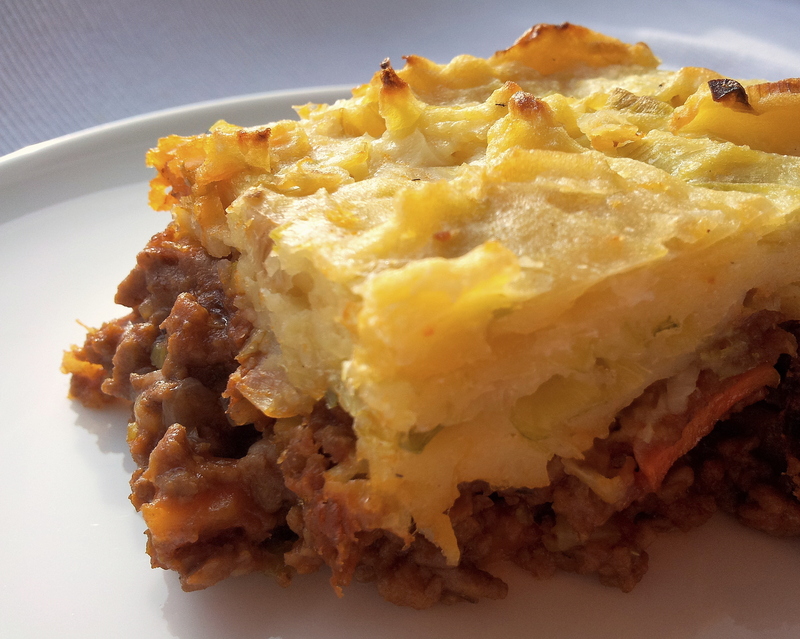 But not – cottage pie it is. No Spring, no Spring food. Anyway, it is either this or start a monumental rant about the weather on Facebook… The pie itself, is delicious, warming and comforting. Stir in the tomatoes, the tomato purée, the beef stock, the Worcestershire sauce and the mixed herbs. Season with a generous pinch of salt and plenty of freshly ground black pepper. Bring to the boil and then reduce the heat. Cover loosely and simmer gently for about 40min, stirring occasionally until the meat is tender. You can start preparing the potato topping. Peel the potatoes and cut them into rough 4cm chunks. Put them in a large saucepan and cover with cold water. Bring to the boil, then down the heat slightly and simmer for 18-20min or until the potatoes are very tender. Heat the oil in a non stick frying pan and fry the leeks for 5min until softened but not coloured, stirring often. Drain the potatoes, then tip them back into the pan, season to taste and mash with the milk (and a little butter) until smooth. Stir in the sautéed leeks and set aside. Preheat the oven to 220oC. When the beef has been simmering for 40min, mix the cornflour with the cold flour to make a smooth paste. Stir this into the beef and cook for another 1-2min or until the sauce is thickened, stirring often. Poor the beef mixture into a 2-liter shallow ovenproof dish. Using a large spoon, top the beef with the mash potatoes and leeks. Spoon the mixture all around the edge of the dish before heading into the middle, then fluff it up with a fork. Bake for 30min until the topping is golden and the filling is bubbling. I have promised not to complaint about the weather on Facebook and extended the ban to all other social media outlets I normally hang out. In here, I shall just carry on posting Winter-appropriate dishes until the weather gets finally better, as a sign of protest. It is a good thing I have plenty of unpublished dishes, as it might be a while before we can move to lighter food… This casserole dish says comfort food all over – it is delicious, filling and feels like something my Mother could have done for Sunday lunch. What else would you want to eat while the snow is slowly pilling outside? Mix the flour and the thyme with a good pinch of salt and pepper into a large freezer bag or bowl. Place chicken into the bag, a few pieces at a time and shake until evenly coated. Reserve the left over flour. Heat oil in a non stick frying pan until is piping hot. Add the chicken a few pieces at a time and let it fry until golden brown (saving any remaining flour in bag). Transfer to heat proof casserole, like a le creuset or equivalent. In the same frying pan you used for the chicken, put the bacon, onions and celery . Sauté for 4-5 mins until lightly browned, stirring often. Add the mushrooms to the frying pan and cook for 2 more min. Tip everything into the casserole with the chicken pieces. Sprinkle with the reserved flour. Pour half the cider to frying pan and stir well to deglaze and remove all the sediments. Simmer for a few seconds, and add to the casserole. Finally, drop in the remaining cider, the stock, carrots and bay leaves. Cover with the lid and place in the center of the oven for 1 hour. Remove from the oven and add in the leeks. Return to the stove and let it cook for about half hour, until the leeks are soft. The calendar claims Spring will be here in a few days, but the weather man (and the knees) say otherwise. As snow starts falling again, it seems Winter will be here forever. 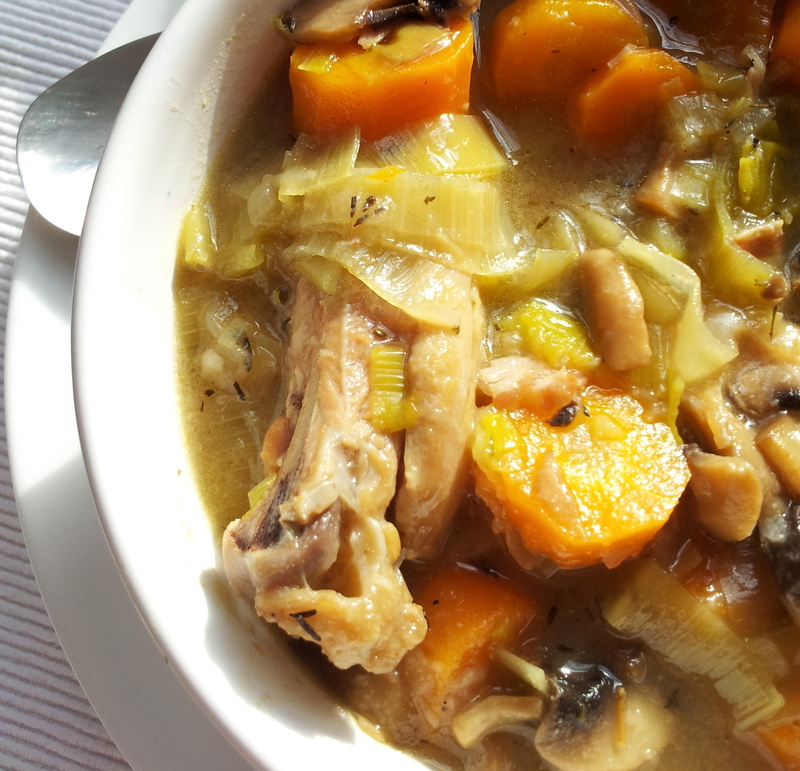 It is definitely time for another comforting stew…. Believe it or not, each portion has less than 500 calories. Put the flour and dried herbs in a large bowl. Season with salt and lots of freshly ground pepper. Fold in the beef chunks and toss in until they evenly coated. Heat the oil in a oven- and flame- proof casserole dish.When the oil is pipping hot, drop in the onions and season then with salt and pepper. Fry them over medium heat until they are lightly browned (about 5min). Tip in the beef and mix until coated. Add the bay leaf, ale, stock, tomato purée and sugar. Stir well and bring to boil. Cover with the lid. Transfer the casserole from to the oven and cook for 1 1/2 hours. At the end of this time, take the casserole out of the oven and stir in the parsnips and carrots. Put the lid again, and return to the over for about 45min until the vegetables are tender. Put the potato chunks in a large sauce pan and cover them with cold water. Bring to a boil. Then reduce the heat and let boil for about 20min, until the potatoes are very tender. In the meanwhile, put the oil in a frying pan and heat. 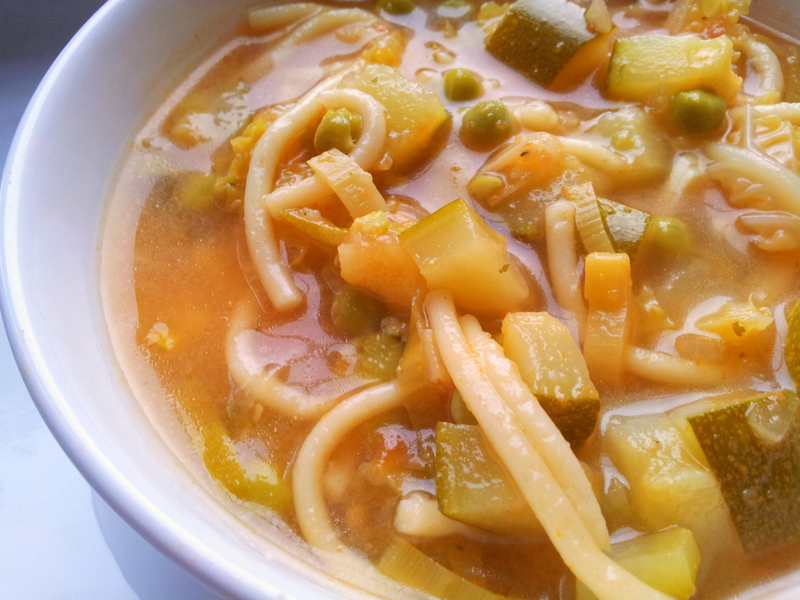 When is hot, drop in the sliced leeks and sautée until soft and tender, stirring often. Drain the potatoes, and put them back in the sauce pan. Season with salt and pepper and mash with the milk until smooth. Stir in the sautéeed leeks. Mix until they are well incorporated. After one month of (almost) daily feasts and non stop indulgence, I ended up with a food hangover of biblical proportions. For a couple of days, I’d rather fight my way through the ironing pile than opening a cook book… Unless it was Dave Myers and Si King’s The Hairy Dieters: How to Love Food and Lose Weigh, which promises dishes low in calories and big on flavor. Not small on portions, though… Their 4 servings are the equivalent of 6 of my portions, and I normally don’t eat like a birdie. But, all in all, it was exactly what I was looking for. A light soup to keep me going while fighting the hang over. First, peel the tomatoes. Prepare the iced iced water in advance (basically, water and ice). Bring a medium pot of water to a boil over high heat. Make a small X in the bottom of each tomato with the tip of a knife. Using a slotted spoon, lower them one a time, into the pot for 10-15seconds. Fish them out and tip them into ice water to cool for about 1 minute. Peel the tomatoes, starting from the X mark on the bottom and pulling back the curled skin. You can now chop tomatoes into dices. In a large non stick frying pan, heat the oil until it is piping hot and drop the onion. Lower the heat and sautée until is soft and translucent. Add the celery, garlic, leek and courgettes and drop them into the pan with the onion. Still over a low heat for a couple of minutes, then stir in the chopped tomatoes, pour over the chicken stock and bring to the boil. Break the spaghetti into short lengths and drop them into the pan. Add the tomato purée and bring the soup back to the boil, then cook for 8minutes stirring occasionally. Add the peas, cabbage and cook for another 5 minutes or until the pasta is just tender. Season the soup with salt and lots of freshly ground black pepper. Serve with a sprinkling of Parmesan and torn basil leaves if you want.